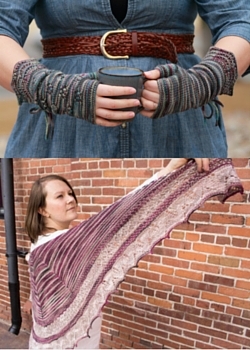 The Final Lorna's Limited Edition Downton Abbey Colorway + Mystery KAL & CAL! 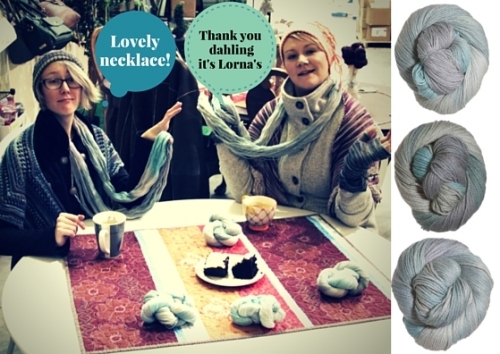 Great Gift Ideas for Knitters & Crocheters! Last Minute Gifts to Knit! New Filatura di Crosa, Tahki, & S. Charles Yarns for Winter! It's that time of year again: no, not the holidays - time to get ready for the next season of Downton Abbey! Many of you may have heard that this will be the last season (but we Beans never say die: we're holding out for a Downton movie! ), so we made this month's Lorna's Limited Edition Color extra special: in fact, Kristen visited Lorna's Laces in Chicago over the summer to help design it with her own two hands! And the result is gorgeous: Yorkshire Skies is an ethereal mix of aqua, blue-grays, and pretty dusky purples to match our vision of the pristine summer sky over Highclere Castle, where the show is filmed. It's the perfect color to evoke a pang of nostalgia as we embark on this final journey with our favorite characters. 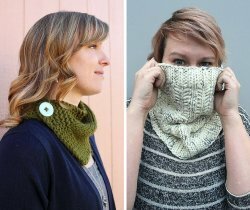 This year, Leanne is joining Kristen in the final big blow-out event with a joint Mystery Knit- and Crochet-Along! Starting with the premiere of the show on January 3rd, Kristen and Leanne will release one clue per week, and at the end of the season, you'll have your very own knit or crocheted shawl to commemorate this special show! Both the Knit-Along and Crochet-Along will use just 2 skeins of Solemate, and we have kits available to make shopping easier!! Then once you have chosen your yarn, visit Ravelry to download your Knit or Crochet pattern and swatching info and to officially "sign up" for the MKAL or MCAL. Then grab your needles and hooks and your box of tissues, and you're off! 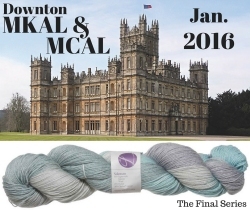 We know you can't wait to get started on the MKAL and MCAL, so while we anxiously await Jan. 3rd, we propose revisiting a previous Downton design and knit it while you wait! We've even created a special Downton Revisited thread so you can chat about the show and stitch away on something to pass the time! Pattern links and ideas are all included at the start of the thread. Crocheters - we know that this is the first Downton MCAL we've done, but we've got you covered, too: head over to the same thread for some crochet project suggestions as well! Just don't forget your set of Limited Edition Spark Stitch Markers - they were created especially to match the beautiful blue-gray hues of the yarn, and they'll look just charming dangling along in your project! Like the Millennium Falcon fleeing an Imperial Cruiser, the Star Wars Use the Force Binge Mystery Knit- and Crochet-Alongs were gone in a flash - but photos of the fabulous projects you all knitted and crocheted are still flooding in! Both the knit and crochet shawlette designs feature short row shaped pies that increase in size to represent the battle between the Dark Side and the Light. Luckily, there's still time to grab the Light Side and Dark Side yarn you need and whip up your very own in time for the premiere of the movie -or, as a special holiday gift for that Star Wars fan you know! The full patterns for both the Knit and Crochet versions are available now, and will still be available at the special MKAL and MCAL price until the end of December directly from the Designers: Marinade Designs or Leawesome! 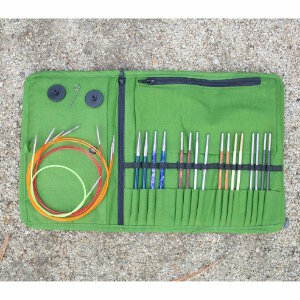 It's the perfect way to try out every type of amazing, hand-crafted needles by Knitter's Pride: introducing Jimmy Jumble Interchangeable Needle Sets! We've teamed up with the folks at Knitter's Pride to curate the ultimate sampler set of interchangeable needles: 8 pairs of interchangeable tips in sizes US 2.5 through US 9 (one size in each of the eight most beloved Knitter's Pride needle types - Dreamz, Karbonz, Nova Platina, Bamboo, Marblz, Nova Cubics Platina, Symfonie Wood Cubics, and Trendz), plus 4 of the new colored interchangeable cords to make 24", 32", and 40" circular needles, 8 end caps, and 4 cord keys! Each colorful bundle comes in a beautiful fabric case with plenty of handy pockets - choose your favorite from five different color options! Then, pair your needles with different yarns to find the ideal combination for each - pretty and practical to boot! Gear up for gifting this holiday season with a few of these fun and fibery treats! Beanie Bag Subscriptions are a hit! 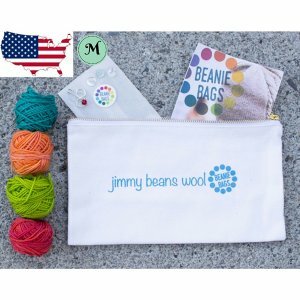 And for such a small package, there's plenty to love: each Beanie Bag is like a little surprise in your mailbox every month, with a cute, custom-made canvas bag full of yarn and accessory samples, patterns, and a few bonus knick-knacks, too! For just $10 per month, shipping included ($15 for participants outside of the US), you can choose from an ongoing monthly subscription, or a 3, 6, or 12-month gift subscription. Yes, they are totally gift-able! Give one to everyone on your list this year! Beanie Bag subscriptions purchased this month (December...how is it already December?!) ship at the beginning of January. Feeling hungry for fantastic fibers? 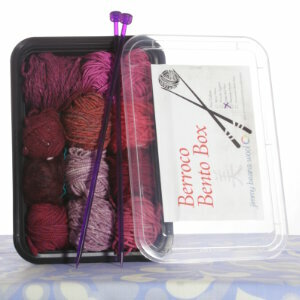 Grab a Berroco Bento Box! Each clever take-out container is filled with twelve 15-yard samples of the most popular worsted and Aran-weight yarns from Berroco, US 7 or 8 straight needles (just imagine they're chopsticks! ), and silicone cupcake liner to hold your stitch markers (or soy sauce!). Plus, each order includes a download code for the Nami Cowl, which Kristen designed especially to use all the yarns in each box! Choose from one of 5 pretty palettes - or, try them all! 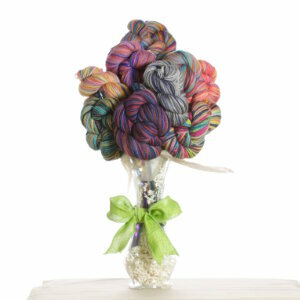 You can never go wrong with one of our beautiful yarn bouquets; unlike real flowers, these keep their bloom indefinitely! Our Koigu Bouquets capture the beauty of hand-painted yarns in Small (3-skein) or Large (10-skein) sizes and continue to be one of our biggest hits with knitters! They come complete arranged in a glass vase with knitting needle "stems" and are packaged with care to ship anywhere you want them to go. 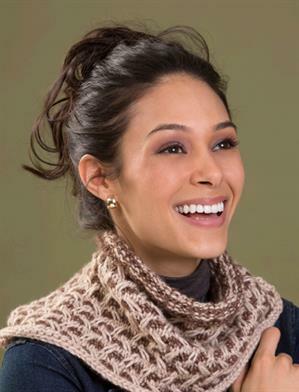 With each bouquet, the ever-popular Koigu Linen Stitch Scarf pattern from Churchmouse Yarns and Teas is included. The Kidsilk Haze Color Block Bouquets and Kits come with everything you need to make a gorgeous, airy, striped wrap, and they're now available in both Knit and Crochet versions! The Kidsilk Haze Colorblock wrap uses super soft Rowan Kidsilk Haze for a cloud-like shawl. Knit or crochet this simple beauty and be ready to wear it in time for New Years! Both the Bouquet and the Kit come with a download link to instructions for either the knit or crochet version! Our Lithosphere Shawl Bouquets and Kits combine Rowan Fine Art and Kidsilk Haze to create a silky-soft wrap in eye-catching colors. Also recently updated to include a crochet version as well, this design holds both yarns together in some areas but not in others to create a unique thick and thin effect that appears airy and gorgeous! Choose a kit or bouquet in one of five different stunning colors! 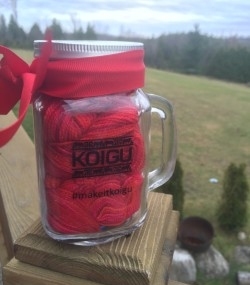 Koigu has done it again with another fabulous holiday gift item! These adorable glass Mason Jar Kits contain two skeins of Koigu Sparkle and a pattern for a cute lacy cowl. As a bonus, the glass itself is reusable - the perfect way to drink your morning coffee or tea! These are limited edition, so be sure to snap them up before they are gone! Just can't decide (or want to leave the decision up to the recipient?)? Grab a Gift Certificate! Available in amounts from $5 to $500, they're always appreciated! We're officially in the countdown-to-the-holidays mode, and when time's short, we're all in need of new ideas for quick, hand-crafted gifts! We polled the Beans, and we all agree: any of these fabulous finds would fill the bill! Start with a yarn from Knit Collage, and in a few hours, you'll have a wonderfully unique gift you might just want to keep for yourself! Their handspun yarns are luxurious and one-of-a-kind, adding an extra bit of sparkle to any project. Just one skein each of Pixie Dust and Cast Away make the Marled Cowl, or just 2 skeins of Pixie Dust for Bright Spot Scarf (Malabrigo Worsted Merino Samples would work great for the pompoms!). 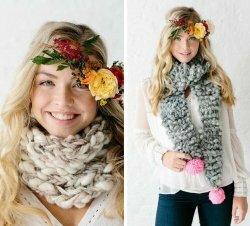 And Gypsy Garden or Daisy Chain would add extra whimsy to the Keep Me Cozy Fringe Scarf! Berroco Gusto is quickly becoming our go-to yarn for super-bulky (and super-quick!) knits! 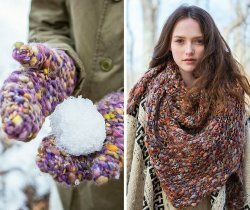 The Aspen Mittens take just one ball of this amazingly fluffy and colorful yarn, and the Blackberry Blossom Cowl uses just 2 balls to make a cushy and cuddly cowl to keep your neck warm even in the briskest breeze! Or, go all out and use 5 balls to whip up the Fir Shawl, and you'll soon be wrapped in warmth from neck to navel! Going for a more neutral look? Borgo de Pazzi Firenze Naturalia is what you need! It has all the super-bulky speed in organic, undyed, 100% wool! The Cowl would be right at home in the Scottish Highlands, and the Cuddle-icious Tasseled Wrap will have you snuggled up in soft wool in the blink of an eye! Only have an hour to spare? 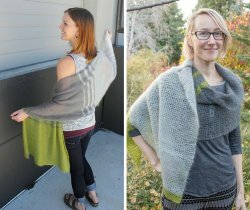 Turn out a Basic Neckie before you can blink in Plymouth Encore Mega or Cascade Salar - best of all, the pattern is free! Or take advantage of Kristen's December promotion in her Marinade Designs Ravelry shop, and download the Slippery Slope Hat pattern, which uses just one hank of Tosh ASAP; or the brand new Pando Cowl, which uses two skeins! The snow has arrived, and so have some terrific new patterns and yarns from Tahki, Filatura di Crosa, and S. Charles! We could hardly decide on our favorites, but here's a sampling of some of the fantastic accessories and garments we'd knit for ourselves! The Amore book is packed with gems in Filatura di Crosa's most decadent yarns! The Celia Tweeded Scarf takes the beauty of Filatura di Crosa Nirvana to the next level; by using three strands of different colors held together, you not only get a quick knit, but one with a beautiful, tweedy look! And there's no better use for luxurious Filatura di Crosa Superior than an elegant Ariel Spiral Scarf; stack several together for a truly angelic (and warm!) fashion statement! 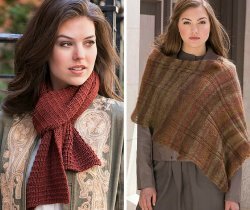 You're sure to love anything you make with Stacy Charles Julie; it's a sumptuous blend of merino and silk, which adds lovely drape and sheen. The Sheep Meadow Scarf shows it off beautifully with a simple but elegant textured pattern. 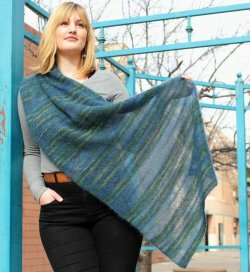 And lofty Luna Effects works up into a gorgeous wrap with self-striping colors built right into the yarn! The Turtle Bay Wrap is airy enough to be worn gathered up as a scarf, or as a wrap that covers your shoulders. Yum! The rest of the patterns in the City Streets book are just as impressive, so grab your copy and get that urban edge! If you're looking for fabulous and functional sweaters, look no further than the Tahki Life Style book! Tahoe is an ideal match for the Elan Pullover or Essence Pullover; it's sumptuously soft and quick-knitting, but light enough for comfortable, oversized sweaters to keep you warm without weighing you down! 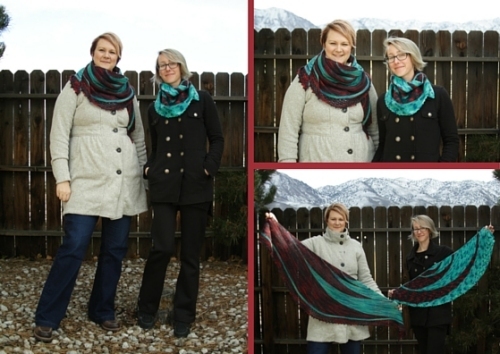 December's Kit of the Month is all about visual and tactile appeal: meet Ingenuity Cowl in Tahki Zona! The clever construction of this bulky-weight yarn, which features a tube of soft netting filled with fluffy fibers, results in a lofty halo and a one-of-a-kind look! Combine two colors (just one ball of each!) to make the interesting Ingenuity Cowl, a free pattern from Tahki that's full of tantalizing texture! And, for the whole month of December, this cool kit is 30% off, so you can make one for less than $12! Happy Holidays, indeed! 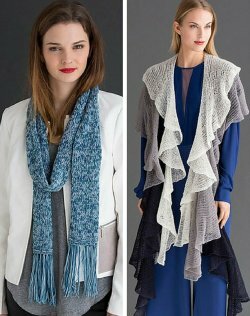 Muench Touch Me Yarns - 50% Off! What's smoother than velvety chenille? Nothing that we know of! That's why we're thrilled that all the Muench Touch Me series yarns are now on sale! From the luminous colors of regular Touch Me, to the sparkly fun of Touch Me Lux, to extra-plush Touch Me Due, we can't get enough! Just a couple of balls are enough for a small scarf or neckwarmer, or even a cute clutch to fancy up that evening out! Get ready to be touched! Tosh Onesies - 15% off! Take advantage of some hand-dyed beauty by stocking your stash with these one-of-a-kind skeins that didn't quite match the rest in the dye pot! They're absolute first-quality, and are perfect for one-skein projects, like baby sweaters or hats, or multi-colored shawls and sweaters! We've got plenty on tap to whet your thirst for fabulous yarn and a good deal: Vintage Onesies, Tosh DK Onesies, Tosh Merino DK Onesies, Tosh Merino Light Onesies, and Tosh Sock Onesies! Whew! What will you make first? 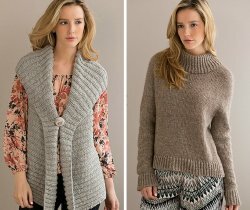 Rowan Fine Art Aran - 50% off! Strike this sale while the Aran is hot (get it?)! Rowan Fine Art Aran is 50% off, but it won't be on the shelves for long - this sumptuous blend of wool, mohair, alpaca, and silk is just too delicious to resist - and in an Aran weight, it will knit and crochet up into projects as quick as they are beautiful! Just imagine wrapping up in a squishy, silky-soft and colorful Opposite Pole sweater by Joji Locatelli! Go on - with this sale, you can afford a sweater quantity! Behold the wonder of Crystal Palace Danube Bulky and Danube Aran - on sale! This soft and squishy single-ply is dyed in long color-changing sections to give your finished projects that gradient look that's so hot right now! With 2 weights on sale, you can knit all of your fall and winter projects from this delightful and vibrant yarn. And with over 10 colorways to choose from, you can knit the entire rainbow! Cascade Sale - 50% off! Stock up on some fantastically colorful yarns from Cascade! Select colors of 128 Superwash Multis and 220 Superwash Paints are on sale for 50% off, so you can knit or crochet up cuddly Afghans, soft and machine-washable baby clothes, and snuggly mittens for the whole family! But these classic yarns always go quickly, so grab them before they're gone! Schachenmayr Original Lumio yarns - 50% off! If you haven't tried Schachenmayr Original Lumio Color, now's your chance - at a steal of a deal! This super-bulky and super fun yarn is spun through with a special reflective thread that glows when light shines upon it! Anything you knit up will reflect light directed at it -bonfires, camera flashes, or even the headlights of a passing car, making it great for head and wristbands to keep you safe while walking or running in low light. Hats, cowls, sweaters, and more will spark in the dark in this awesome yarn! And don't forget about Lumio Cotton: this super-bulky superstar is a versatile cotton and acrylic blend with the same fun strand of reflective tape spun right into the yarn! 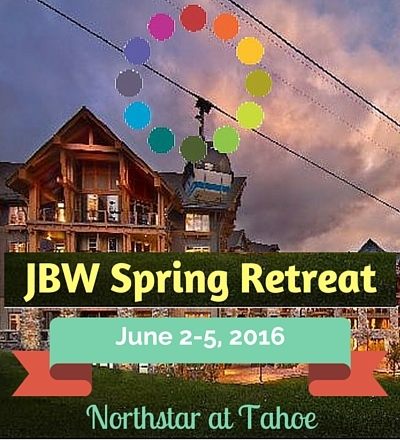 Here's something special to dream about this winter: we're announcing the dates for our JBW Spring Retreat! We'll be returning to the beautiful Northstar resort and staying in the Village from June 2nd -5th, 2016, checking in on Thursday and saying our tearful goodbyes on Sunday. But here's the part you really want to know: our instructor for the weekend will be none other than the fabulous Amy Herzog! And, of course, your favorite Beans will be there, plus new and old friends from past retreats to rub elbows with as your needles click away together! Please email retreat@JimmyBeansWool.com with questions, or check back on our website on January 15th, 2016 to register! We have a feeling this one is going to fill up fast, so stay tuned and be sure to register on January 15th!